The Ball Valves in this category are all lead-free and approved for potable water use. Find valves with press, threaded and sweat connection. The BV014T-LF from Wright Valves is a 1/4” NPT Threaded Brass Ball Valve, Full Port (Lead-Free).&nbs.. The BV012S-LF from Wright Valves is a 1/2” Sweat (Solder) Brass Ball Valve, Full Port (Lead-Free). .. 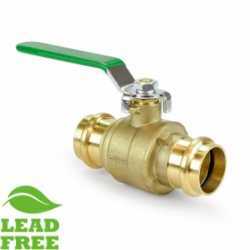 The PBV034-LF from Wright Valves is a 3/4” Press Brass Ball Valve, Full Port (Lead-Free).Techn.. The 50312W from Webstone Valves is a 1/2” Sweat x 3/4” Garden Hose Ball Valve, Full Port (Lead-Free).. The PBV100-LF from Wright Valves is a 1” Press Brass Ball Valve, Full Port (Lead-Free).Technic.. The PBV114-LF from Wright Valves is a 1-1/4” Press Brass Ball Valve, Full Port (Lead-Free).Tec.. The PBV112-LF from Wright Valves is a 1-1/2” Press Brass Ball Valve, Full Port (Lead-Free).Tec.. The BV200S-LF from Wright Valves is a 2” Sweat (Solder) Brass Ball Valve, Full Port (Lead-Free).&nbs.. The PBV200-LF from Wright Valves is a 2” Press Brass Ball Valve, Full Port (Lead-Free).Technic.. The BV212T-LF from Wright Valves is a 2-1/2” NPT Threaded Brass Ball Valve, Full Port (Lead-Free). .. The BV300S-LF from Wright Valves is a 3” Sweat (Solder) Brass Ball Valve, Full Port (Lead-Free).&nbs..